"Sometimes people see things that they're not sure they should be seeing, things that aren't really there, things out of the corner of their eye. Do you never see anything out of the corner of your eye Doctor?" This clip shows an excerpt from one of the first performances in the crypt of St Mary's Church Islington. Later on we were thrilled to be able to use a real French magic lantern to project our original medical slides. Madeleine on Tiptoetells the strange and little known story of Madeleine Le Bouc, the 'Angel of Paris' who walked the streets on tiptoe at the end of the 19th century, and the unique relationship she formed with the man who cured her. Hit Gelamp delved into the two large volumes written about her case by the man who invented the word 'subconscious' - a contemporary of Freud and early pioneer of psychoanalysis, Dr Pierre Janet. Madeleine on Tiptoewas performed by Louise Radinger and Chand Martinez in the SUSPENSE London Puppetry Festival 2011 in November 2011. The original French magic lantern used in this production was kindly loaned to us by Richard Rigby of the Magic Lantern Society. 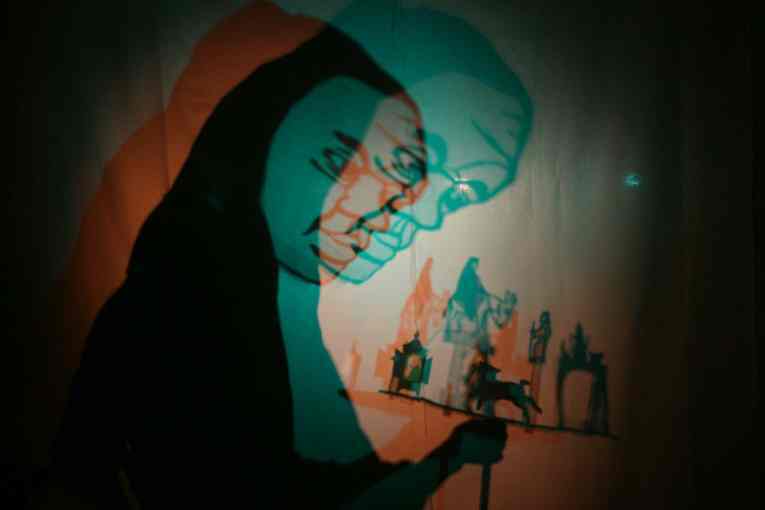 "enthralling, thought-provoking, and profoundly original"
"The combination of acting and the inventive and innovative use of shadow puppetry accompanied by a haunting musical score make for a magical and moving experience." "mesmerising, beautiful, totally original. I really loved this show."